Easy-to-release drop-arm mechanism allows larger patients to laterally transfer safely and with ease. Powder coated steel is rust resistant. Extra wide seating area and higher weight capacity is ideal for larger patients. Seat height range, 19.5" (48.9 cm); Seat depth, 19" (48.3 cm); Width between arms 28" (71.1 cm); Overall width, 29" (73.7 cm). 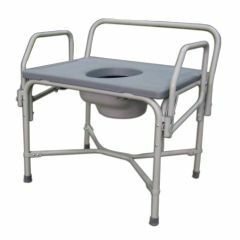 AllegroMedical.com presents The Bariatric Drop-Arm Commode. Easy-to-release drop-arm mechanism allows larger patients to laterally transfer safely and with ease. Powder coated steel is rust resistant. 850 lb. weight capacity. Extra wide seating area and higher weight capacity is ideal for larger patients. Reinforced frames for greater weight-bearing capabilities. Seat height range, 19.5" (48.9 cm); Seat depth, 19" (48.3 cm); Width between arms 28" (71.1 cm); Overall width, 29" (73.7 cm).